So yes, just like last year, I left my Hoffman Challenge entry until almost the last possible minute. Why? Well it could be I’m just that good at procrastination. It could be I’m easily distracted. Or it could be that I want to have a ready excuse if the judges don’t like it–well, I did it in two weeks, so what do you expect? Except my inner critic can throw back that I did it that fast in 2003, too, and the judges put it in the exhibit, so it’s really not a good excuse at all. Next year I might as well start earlier, provided I get an idea, and I usually have plenty of those. As I mentioned last entry, I’ve had this particular idea for months, since I saw the challenge fabric the first time. It’s butterfly wings, but I saw mushroom caps. Once I started cutting up the fabric, it turned out there were many different mushrooms in there, some even with their stems already attached. For the center, I went with last year’s technique of scanning the fabric, enlarging the motifs, and printing the parts I wanted onto inkjet fabric. I wished I’d done a high quality test print onto paper first, since the colors washed out some and looked pale next to the original fabric. 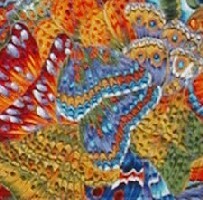 I pondered doing heavy quilting with rayon thread to add color. I pondered painting or drawing or adding sequins or beads. Perhaps if I’d had more time I would have done one or more of those things, but instead I quilted them with gold metallic thread and hope that adds enough interest to distract people from the paleness. I did the center first and based on how big that turned out planned the smaller blocks at the top and bottom. Like last year, I went the fusible applique route, so they went together quickly. I didn’t have to hunt too long in the fabric closet for the rainbow stripe for the sashing. The smooth sailing was interrupted when somehow the center block turned out too big for the top and bottom units. What? I calculated; I measured; I thought I had it right. Nope. Fortunately, I had enough margin to trim the center to match and moved on to the border. I really wanted the border to be simple, fast and easy to do. I tried all sorts of things on the felt wall, but my first idea for squares wouldn’t go away, so I gave in and started cutting tiny pieces. I used a single batik in every other spot, putting the lighter pieces in two of the corners and the darker ones in the other two. I used the challenge fabric in some of the squares, blended with two other colorways of the same print–the cool colors in the corners and the warm colors in the middle. Somewhere along the way sewing them all together I got a couple pairs mixed up (on the bottom border, for those of you who want to play “spot the mistake”) but didn’t notice until the whole top was together so I just left them where they are. I can almost make a case for it adding a welcome note of asymmetry. Mr. Karen had a good idea about the quilting–to do rotting logs in the background, because that’s where mushrooms grow–but I wasn’t sure I could figure out how to do that and make it look good. I ended up just stippling the background, even though I think stippling is overused. I tried echo quilting, but it just didn’t look good and was taking too long besides. Stippling it was, then. Stippling I can do. Then it was on to the mushrooms. 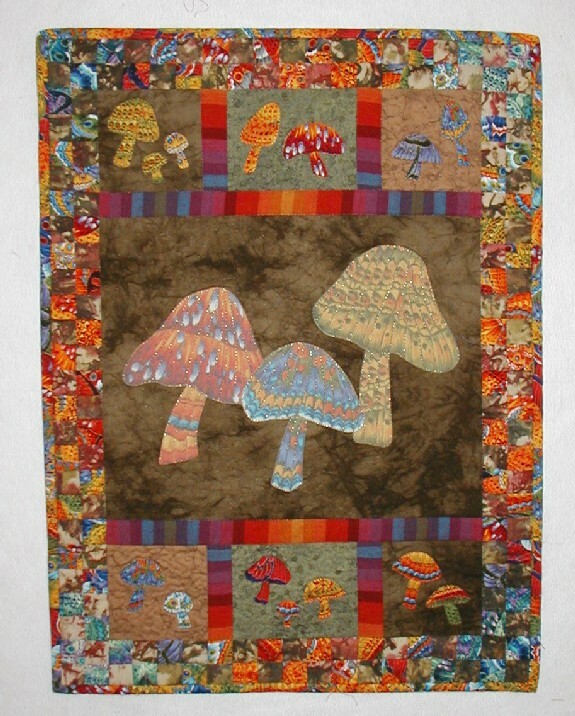 After the gold in the middle, I did the smaller mushrooms with about five different colors of rayon (one color per ‘shroom). That brings us up to Tuesday evening. That would be the night before I wanted to send it out. That would mean that the binding would have to be done after 9 o’clock. You can probably guess how that turned out. Well, actually it turned out okay, if you don’t look really, really closely at it. I had the binding sewn most of the way around the front and only had to make those two diagonal cuts to join the ends. I made them, but unfortunately did the second one in the wrong direction, leaving a big vee shape of air where there should be fabric. Thank heaven that was on the side of the binding I was going to turn to the back. Thank heaven I didn’t go with the single fold binding I considered because it would be easier to make nice miters at the corners. Thank heaven there’s no such thing as forensic quilt judging, because I do not want that binding opened up to reveal its secret. I ended up sewing the binding down by hand. I usually finish it by machine, but the first part I did that way this time just looked so bad (it was well after 9 by this point) that I figured I needed to take a different approach. Besides, fixing the problems with the machine stitching would probably have taken me just as long anyway. I put the last stitches in the binding at around 11:30 Tuesday night and decided to finish in the morning. Good thing I didn’t have any meetings scheduled and that we have flextime at Purple Systems, because by the time I tied off all the loose threads and hid the ends (and of course some of them broke off and needed special hiding techniques), made the label and sewed it on and then fastened down the bottom of the hanging sleeve and filled out the entry form and dropped it off at the shipping store, I was two hours late. But hey, at least I didn’t take six weeks off for surgery this summer. So now I wait. Will my acceptance or rejection for this year come to me before or after the potholder’s return? We’ll just have to wait and see. One year ago today, I was busy working on the potholder and thus not available to write an entry. Two years ago, I was surprised.